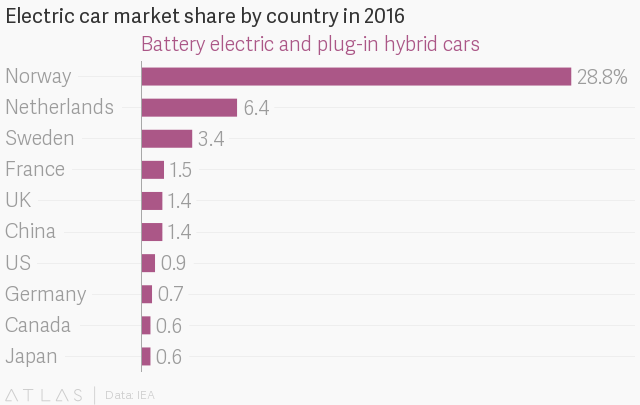 Norway is miles ahead of the rest of the world in its adoption of electric cars, thanks to a series of generous government subsidies. But policymakers have often worried that the subsidies are too good amid criticism that they simply allow rich households to buy expensive electric cars on the cheap. Last month, Norway’s current minority government proposed to pull back tax incentives on electric cars that weighed more than two metric tons. It immediately became known as the “Tesla tax” because it was mostly likely to increase the cost of the new Tesla Model X, an SUV. Six weeks later and the government delivered a U-turn and scrapped the plan. The Tesla tax was proposed as part of next year’s budget with the finance minister arguing that heavy electric cars caused a lot of damage to roads and their owners should contribute more to the cost of upkeep. However, the traditional center-right allies of the current government had opposed the idea because of previous government commitments to keep electric car incentives in place until 2020 and the new plan broke this promise. An agreement between the parties this week to pass the budget has seen the plan abandoned. This will be good news to Tesla who had said last month—after the Tesla tax was announced—that it planned to build Europe’s largest charging station in Norway. There are more than 13,000 registered Teslas in Norway, according to the national statistics office, though the Nordic country has a more than 100,000 electric cars.